Syd Tyrrell's first book, 'A Countryman's Tale' first published in 1973, has become an important historical record of how life was lived in a small English village in a bygone age. Syd's way with words, and his sharp comments, made the book a worthwhile read for a wide audience and the book was re-printed for a special book club edition and for the National Trust. The book is about 'real' village people and their lives. Syd Tyrrell didn't like snobs and some of the book's descriptions of people were what a reviewer called 'a little bit blunt'! Syd prided himself on telling the truth as he saw it, he wasn't out to please or impress others. It comes as no surprise that his first book had to stop short of more recent history for fear of offending the living. 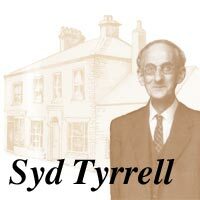 After the passage of a further 28 years, his literary executors felt the time was right to send his second book, entitled 'Syd Tyrrell's Eydon', to the printers. Syd Tyrrell's Eydon has been lightly edited by the Eydon Historical Research Group and illustrated with drawings by Sonia Hawes. It also contains reproductions of a number of photos showing some of the people and places mentioned in the book. The book is in hardback and priced at £15.00. Copies of 'Syd Tyrrell's Eydon' are available from the Eydon Historical Research Group and from book shops in local towns. Many copies have been supplied by mail order after an excellent review in Saga Magazine. You can hear Syd talking about his new book by clicking this link. This page requires the Flash plug-in, if you don't have it installed on your computer, you will be taken to the plug-in download site so you can have it installed for you.